The combination of skyrocketing rents and stagnant incomes continues to push record numbers of New Yorkers into homelessness, leaving them with nowhere to turn but a shelter system that is bursting at the seams. New York City has a legal and fundamental moral obligation to provide shelter to anyone who has no other place to stay, which is why we don’t have the massive tent encampments found in other major cities. Opening these necessary shelters, however, can elicit a range of responses from people who live nearby. The Coalition for the Homeless continues to call on the City to commit more resources to permanent housing, which will reduce the need for shelters, but it is imperative that the City have sufficient shelter capacity for the men, women, and children who need it right away. When Mayor de Blasio unveiled “Turning the Tide on Homelessness” in February 2017, he announced a plan for the City to open 90 new shelters to replace expensive and inadequate models like cluster-site facilities and commercial hotels. The Mayor explained that homeless people come from every neighborhood in the city, and they can get back on their feet more quickly if they are sheltered close to their existing community ties like schools, jobs, social supports, doctors, and churches. Many people immediately latched onto the number 90 and speculated about which neighborhoods would see the opening of new shelters. Word of the first shelters drew vociferous protests and legal actions in an effort to stop the new facilities from opening. Reading the headlines or watching the local news, it’s easy to think that all New Yorkers have an instinctive aversion to homeless shelters. But although they might not be as loud or as well-publicized as the protesters, there are many New Yorkers who instead react to the news of a shelter opening in their community not with knee-jerk resistance and hyperbolic alarmism, but with understanding and rationality. They are motivated by a genuine desire to help those who are experiencing the trauma of homelessness, and open their arms to those in need. These compassionate communities recognize that no one wants to be homeless, and that the kindness of fellow New Yorkers can make all the difference to families and individuals desperately trying to piece their lives back together. 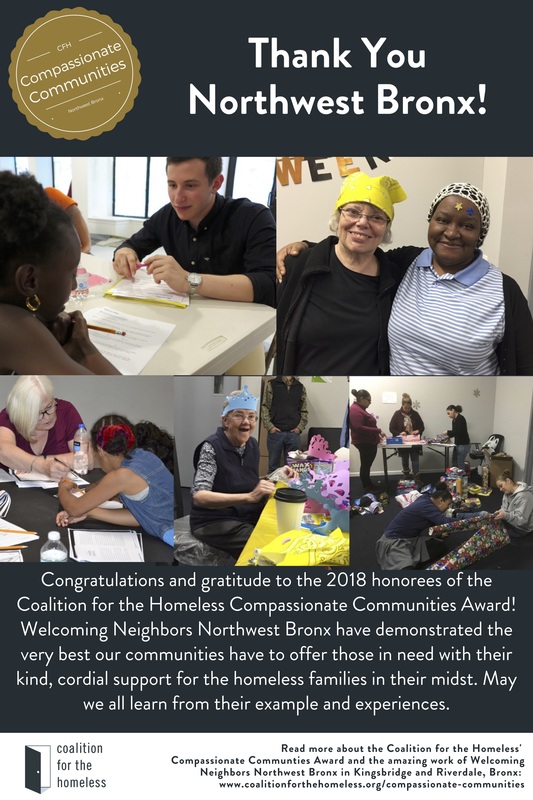 In the spirit of the season, and with a desire to bring well-deserved attention to inspiring examples of human kindness, the Coalition for the Homeless is proud to announce the recipients of our third annual Compassionate Communities Award: Welcoming Neighbors Northwest Bronx. 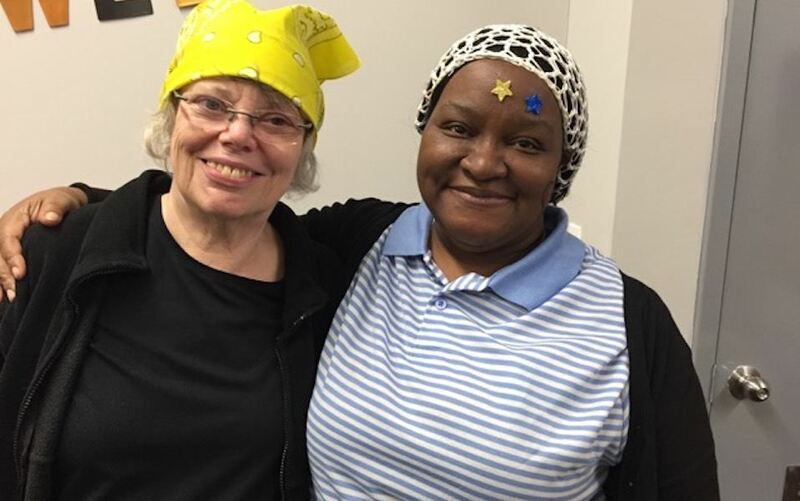 Welcoming Neighbors volunteer Fran Sears and Broadway Family Plaza resident Ms. Green enjoy a moment together at a Halloween party. The rumors started floating around the Kingsbridge and Riverdale neighborhoods of the Bronx in the summer of 2017: Neighbors had heard that the new building on Broadway was going to become a shelter for families with children instead of market-rate housing as initially planned. When the local media confirmed that the Broadway Family Plaza would be opening that fall, the murmurs turned into shouts. 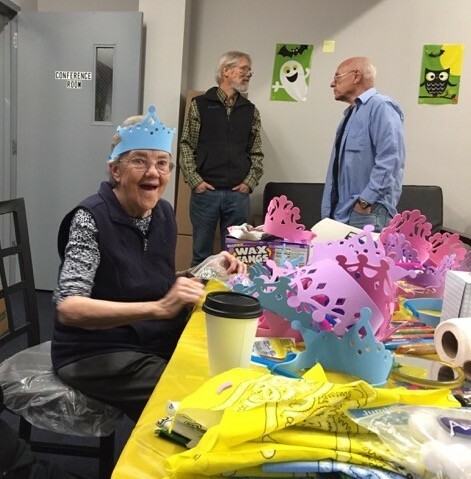 Sr. Mary Kay Finneran makes Halloween decorations while other Welcoming Neighbors volunteers Ivan Braun and Gene Binder talk in the background. After a few meetings, they settled on a name for their ad hoc group: Welcoming Neighbors Northwest Bronx. “That name came out of what we thought was our real purpose: To make the residents that were going to be moving into that building just feel welcome in the neighborhood so they didn’t have to feel fearful of where they were coming to,” Ivan explained. The community members who started attending the Welcoming Neighbors meetings came from different backgrounds but were united in their mission to help their new neighbors. Some were longtime community activists, but many other members did not know each other previously. The group quickly gained momentum. 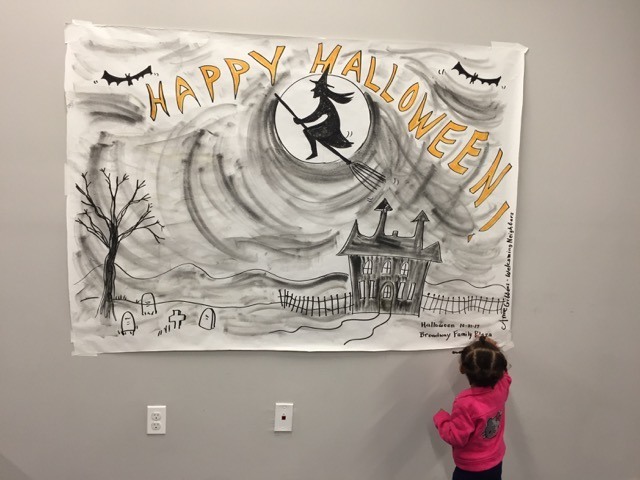 A toddler living at Broadway Family Plaza admires the Halloween decorations created by a Welcoming Neighbors volunteer. With Thanksgiving around the corner, Welcoming Neighbors had an ambitious goal to provide complete dinners for each of the 83 families in the shelter. They hosted a fundraising drive and raised $2,500, which they used to purchase turkeys and all the standard fixings for every family. A group of Broadway Family Plaza residents and Welcoming Neighbors volunteers wrap holiday gifts for the children. 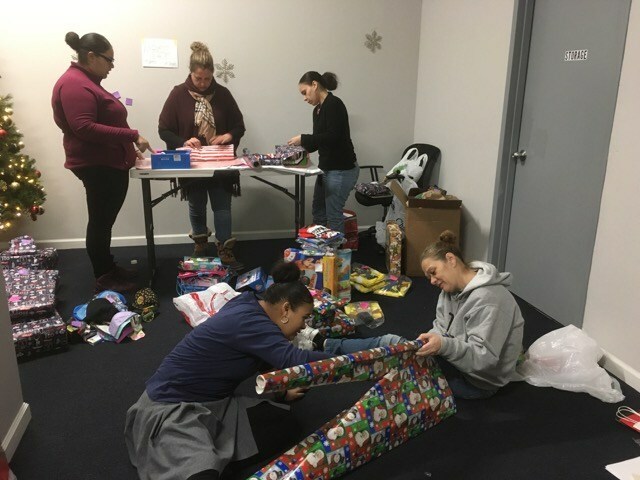 They kept up the holiday cheer with a party in December, where they, in partnership with the Office of Bronx Borough President Ruben Diaz Jr., gave presents to all of the kids. “The holiday activities were practical things we could do that were above and beyond what the facility was able to do at that time because they were busy getting new people settled in,” Ivan said. They also organized card-making activities in advance of Mother’s Day and Father’s Day. 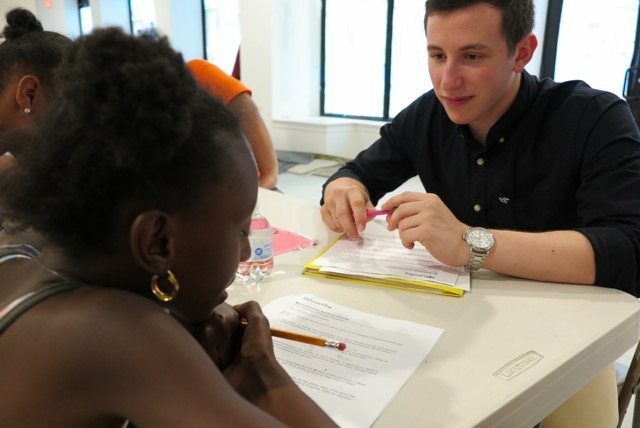 High school student and Welcoming Neighbors volunteer tutors a middle schooler in math. 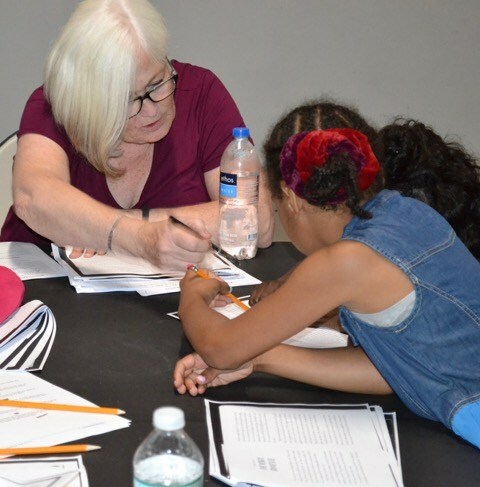 The summer tutoring was so successful that they decided to continue it as an afterschool program when the new school year began. Welcoming Neighbors coordinates with students from a nearby college to tutor about 30 kids. Next, they hope to volunteer for a program to help some of the shelter residents improve their English language skills. Welcoming Neighbors volunteer Annemarie Golden helps a student with reading comprehension. Coalition for the Homeless congratulates all of the Welcoming Neighbors volunteers for taking the proactive steps needed to help build bridges in the community and support not only the provision of services to those in need, but to render those services directly in such a constructive, one-to-one framework that has the power to change the lives of everyone involved. Find answers to frequently asked questions on how to help homeless men, women and children that you encounter in your community. Join our online community and receive monthly news on homelessness in NYC, updates on the Coalition’s advocacy efforts and ways you can get involved and take action. Follow us on Twitter, Facebook and Instagram to see our work in action every day and learn how to help. Support our 11 frontline programs that help 3,500 homeless New Yorkers each day with emergency services, food, job training, housing, and more. Click here to learn about volunteer opportunities, events, drives and sponsorships, easy advocacy actions and other ways to take action.